Cobblers boss Keith Curle says he wanted his players to have the chance to ‘switch off’ over the weekend after revealing he turned down the opportunity to move Tuesday’s Checkatrade Trophy tie at Cambridge United. 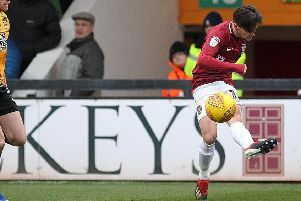 With both Cambridge and Northampton knocked out of the FA Cup in the first round, there was the possibly that, had all parties agreed, their clash at the Abbey Stadium could have been moved from tomorrow evening to Saturday afternoon. It was an opportunity to see players and opposition first-hand rather than looking at information because I trust my eyes and I trust the eyes of my staff. A similar situation occurred last season when Town played Portsmouth in the Checkatrade Trophy on the same weekend as the FA Cup second round, but this time Curle opted against doing so. “We had the option of playing the game against Cambridge on the Saturday but I thought it was important to shut the place down for the players because they’ve had a busy period,” he explained. “A new management team has come in and there’s been a new regime to adapt to so it was good to clear the building. “We had a meeting on Thursday that was basically a 10-game overview of the league games so far. We’ve won four, drawn four and lost two and we took all the positives out of those and we looked at all areas we can still improve on. “It was a good use of time and the players went away feeling positive even though it came on the back of a defeat last Tuesday. There were still positives to come out of that game and there were positives to come out of the 10-game overview. Curle also wanted to make good use of a rare free Saturday afternoon by going off on a scouting mission with the rest of his coaching staff. He added: “We saw it as a good opportunity to send out staff to go out and look at potential opposition and potential targets that we’ve identified. “If the situation is right for ourselves and the opposition player, we’ll be able to do something in January so that was a good chance to get some first-hand intelligence.